(CNS): One of Cayman’s few remaining traditional houses is up for sale. 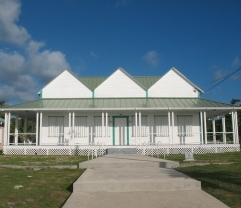 The Spellman McLaughlin Home on Cayman Brac played a part in Cayman Islands history when it sheltered 133 people in the 1932 Hurricane and served as a medical and distribution centre for scarce emergency supplies after the storm had passed. Located in the Creek district, the home and its adjoining lot, which contains a private graveyard, is priced at US$375,000. With many such homes either being torn down to make way for modern developments or being left to decay, the house is amongst the few of its kind that has been maintained and is in good condition. Construction on the home began in 1926, with Captain Spellman McLaughlin overseeing every aspect of the construction process, according to the National Trust. Largely built of imported wood from Mobile, Alabama, the home was completed in 1930 and Captain McLaughlin and his wife raised their four children there. When he passed away in 1991, he willed it to his youngest child, Brunzil McLaughlin-Rivers, who renovated the home and lived there with her husband and son until they left the island in recent months and put the home up for sale. The home covers 1,628 square feet and has eight exterior rooms built around a central dining room. It has a complete wrap-around verandah, and while modernised to accommodate television, internet and telephone service, as well as kitchen and bathroom facilities, the home has changed little since 1930. Recognising the privately-owned home’s architecture and history, in 1995 the National Trust for the Cayman Islands gave its current owner, Brunzil McLaughlin-Rivers, the Award of Distinction for the Preservation of Historic Places. However, according to the Trust’s Historic Programmes Manager Denise Bodden, they only have jurisdiction over homes which are donated to them and cannot financially afford to keep every historic home in the Cayman Islands under their care. Therefore, they encourage homeowners who live in historic homes to care for them. “I would suggest that those who have traditional Caymanian homes on Cayman Brac should try to protect them before development really hits the island,” said Bodden. She said that the Trust has recognised a number of homes on the island that should be protected under the law, particularly the Spellman McLaughlin Home, the Carter House and the Eldemire House, for their unique architectural elements, the fact that they are among the oldest structures on the island and because they survived both the devastating hurricane of 1932 andHurricane Paloma in 2008. Bodden also had a message for the new owners of the Spellman McLaughlin Home: “I hope they realise that they will own a valuable piece of history and that it was built with a lot of love, care and skills,” she said. The home is listed with McLaughlin Properties on Little Cayman. To Anonymous (not verified) on Tue, 08/16/2011 – 15:58. "sad reflection on these islands if this is your definition of heritage or historic………"
The aforementioned post is reflective of a shallow insular mind, inflicted with a singular purpose to urinate on a community and culture that has likely provided the person with much beyond what they have enjoyed in their country of origin. No attempt to offer logical and dignified clarity would enlighten this person. The history of Cayman Brac and it's peoples will be of little or no interest to this person. The post was is hardly an expression of ignorant sentiment. it is calculated mischief. I am so very happy to see this story and also sad. I am a great niece of Spellman McLaughlin. My grandfather's name was Gilbert Stanton McLaughlin, Spellman's nephew. Gilbert went to Jamaica and was a Sea Pilot My father was born in Jamaica. So for me, it is extremely interesting to be able to read about and see the house of relatives in Cayman. I certainly appreciate the newsworthiness of this article. I only wish I could afford to buy the house myself and keep it in the family. Thank you for writing this article Joshua. A big thank you to Joshua Dilbert for taking the time to display pride in his island’s history and making an attempt to educate our residents. Would be nice if the house could be kept and used for cultural events.Too many old places going to the bulldozer these days.Its a good thing we kept Miss Lassies house in South Sound.That would have been a terrible loss for these islands.Maybe the Trust will be able to step up and save this one(Mr.Dart possibly)? So how do you define heritage and history? What do you consider worth? Pleaes provide an example or examples? Are you an "authority" on the subject? Ours is a subtle and understated history, much like the people that used to live on the Island. Unfortunately if it it is not loud and obnoxious then ignorant people do not get it. Good Writing Joshua keep up the good work! Thanks Wendy for giving a young Caymanian a chance to nurture and grow his talent. Preservation of historic buildings flora and fauna should be a legal requirement in Cayman as it is in many countries. Especially given how little of cultural significance we have left…. Too bad all the regs and fees operate to make it too expensive to build wrap-around verandas on new houses. That porch probably equals the square footage of the house and would double the fees to build one new. Why is this news? Why not also do a piece on each of the historic trees on private lands that are being cleared each day? Perhaps you are missing the point. It is news worthy as the home is very significant to the Brac's history and it is now up for sale. We can only hope that that any new owner will love and care for it, as much as the McLaughlin/Rivers family have done. I would encourage you to 1) read "The '32 Storm" to better understand the matter and 2) talk to any person who lived through the horror of the 1932 hurricane in the Brac to better understand why this house is so important. To summarize for CNS readers, it served as a shelter during the hurricane, it was one of a handful of homes left standing after the event and it later served as a depository for supplies coming into the island when people were literally starving and living in caves to protect themselves from the elements. The architecture stands out. “Brunzie” as she is known to my family, told me more than once how she would be at home going about her daily chores, only to turn around and find a group of tourist behind her with a camera, clicking away. She would always accommodate with a little tour and friendly conversation, free of charge. I’d dare say this is much more that 4 walls and a roof to our island’s visitors as well. It is NOT ONLY the trees which are under attack by future development in the Cayman but also the last remaining fragments of our built heritage. Have you bothered to notice that most historic homes utilized native or endemic hardwoods to provide structural integrity? Check out the stilts most homes stand on. A little balance of appreciation between the trees and our built heritage would be appropriate as BOTH add to the definition of who we are as Caymanians, what is special about the place we have CHOSEN to call home and sets an ambiance for our tourism product. And does news always have to be murder, mayhem and whatever gory story you want to always read. I bet if he'd written about some poor person mishaps or something that degraded someone that would have been just peachy for you. Its refreshing to see something different and teach you something all at the same time. I knew that some people used the house as shelter, but from this article I learned more. Some people just like to revel in other peoples misery, but I am glad that CNS is giving this young man an opportuinty to write and he does some refreshing articles. Geez give the kid a break, as nothing really happens in the Brac he is being very creative in finding things to write about. CNS thank you and hope it continues, because God knows nowadays you need to read something a little different. Instead of being negative and preempting your comments with "why is this news". Your opinion would have been better served by being positive about this ariticle and then making a suggestion onother material/matters that Joshua could write about. More money for ju ju to find. We know that it is already sold. Well I believe the government can justify buying this property as it is of historic importantance to the people of the Cayman Islands. Hon Deputy Premiere I encourage you to buy this building so that generations to come may get to know and share in the amazing history of Cayman Brac. Really, so how is it sold to?